Benjamin Rush Milam was born 1788 in Kentucky. He enlisted in the Kentucky militia and fought for several months in the War of 1812. In New Orleans in 1819 Milam met José Félix Trespalacios and James Long, who were planning an expedition to help the revolutionaries in Mexico and Texas gain independence from Spain. Milam joined Trespalacios and was commissioned a colonel. While they sailed to Veracruz, Long marched to La Bahía, which he easily captured, only to discover that the people and soldiers there were revolutionaries, not Royalists. They gave him a hostile reception, and he moved on to San Antonio. In Veracruz and Mexico City, Trespalacios and Milam met with the same reception that Long had received and were imprisoned. Ultimately, with General Long, they were able to legitimatize their purposes and intentions to the new revolutionary government which, in turn, accepted and treated them with respect and generosity. Long was shot and killed by a guard under circumstances that convinced Milam that the killing was plotted by Trespalacios. Milam and several friends then planned to kill Trespalacios. The plot was discovered, however, and Milam and his friends were imprisoned in Mexico City. Through the influence of Joel R. Poinsett, United States minister, all were released. By the spring of 1824 Milam returned to Mexico, which now had adopted the Constitution of 1824 and had a republican form of government. In Mexico City he met Arthur G. Wavell, an Englishman who had become a general in the Mexican army. Trespalacios, now prominent in the new government also, made overtures to Milam to renew their friendship, and Milam accepted. He was granted Mexican citizenship and commissioned a colonel in the Mexican army in 1824. In April 1830 the Mexican Congress passed a law prohibiting further immigration of United States citizens into Texas. This was one reason why Milam, as Wavell’s agent for his Red River colony, and Robert M. Williamson, as agent for Milam’s colony, were not able to introduce the required number of settlers specified in their empresario contracts, which were due to expire in 1832. In 1835 Milam went to Monclova, the capital of Coahuila and Texas, to urge the new governor, Agustín Viesca, to send a land commissioner to Texas to provide the settlers with land titles. Viesca agreed to do this. However, before Milam could leave the city, word came that Antonio López de Santa Anna had overthrown the representative government of Mexico, had established a dictatorship, and was en route to Texas with an army. Viesca fled with Milam, but both were captured and imprisoned at Monterrey. Milam eventually escaped and headed for the Texas border, which he reached in October 1835. By accident he encountered a company of soldiers commanded by George Collinsworth, from whom he heard of the movement in Texas for independence. Milam joined them, helped capture Goliad, and then marched with them to join the main army to capture San Antonio. 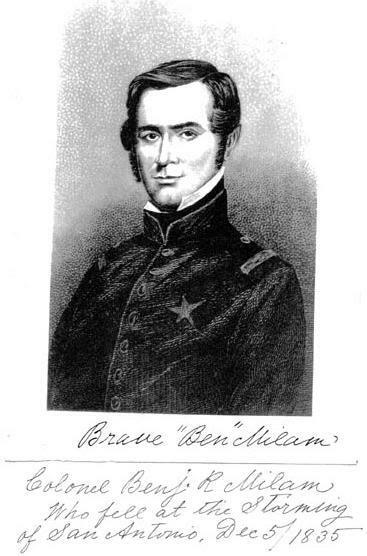 While returning from a scouting mission in the southwest on December 4, 1835, Milam learned that a majority of the army had decided not to attack San Antonio as planned but to go into winter quarters. Convinced that this decision would be a disaster for the cause of independence, Milam then made his famous, impassioned plea: “Who will go with old Ben Milam into San Antonio?” Three hundred volunteered, and the attack, which began at dawn on December 5, ended on December 9 with the surrender of Gen. Martín Perfecto de Cos and the Mexican army (the Siege of Béxar). Milam did not survive to witness the victory, however. On December 7 he was shot in the head by a sniper and died instantly. In 1897 the Daughters of the Republic of Texas erected a monument at Milam’s gravesite in Milam Park, San Antonio. The marker was moved in 1976, and the location of the grave was forgotten until 1993, when a burial was unearthed that archeologists think is probably Milam’s.